I had already mentioned in my last post that it is time to lose control of the diet and get one self in Holiday mode, stuffing up with the delights that always taste better during this season. As temperatures drop in the Northern hemisphere what can be better to warm one up than little tiny shots of rum balls. These little bullets can punch up the taste buds and the flavor of rum is perfect to put you in your festive mood. This is a no-bake recipe, so it is extremely easy and rapid to make, and I can say completely hassle free. Rum Balls are popular in the Germanic countries during the festival season and the primary ingredient of rum balls are chocolates and as the name suggests, of course rum. Since the balls are not baked, the original flavor of the rum is not lost during their preparation. So I must also point out here that the quality of rum used is very important in the final taste of these balls. 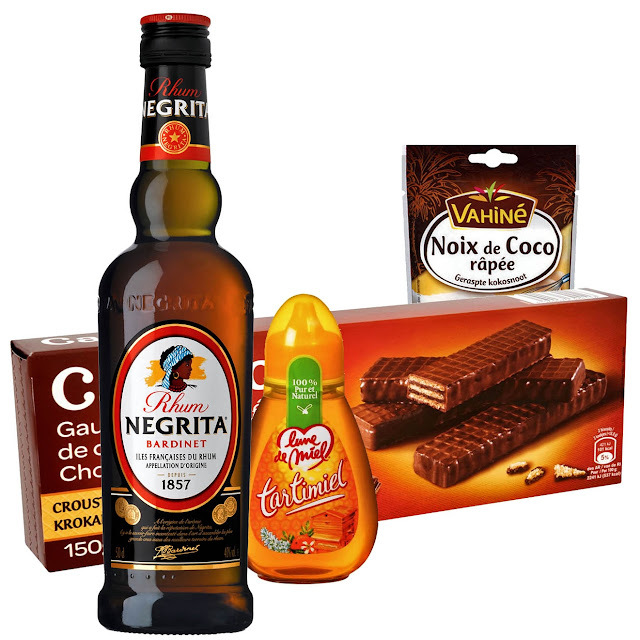 I used the rum made from sugarcane juice in the French Antilles (Caribbean islands) of the brand Bardinet (Negrita). This is typical French rum called the Rhum Agricole. I made these rum balls with chocolate coated wafers that you can find in your local supermarkets. The wafers add a crunch to the rum balls which I personally like. Again I must mention that using readymade wafers makes this preparation completely hassle free. Finally the rum balls were coated with grated coconut to add a tropical flavor to the rum balls. Here is the recipe. Easy rapid hassle free rum balls made with the French rum called "Rhum Agricole" and ready made chocolate coated wafers with a touch of coconut. Put the wafers in a zip lock bag and crush them using a rolling pin. Place it in a deep bottomed bowl. Place the almond flakes in the same zip lock bag and crush them coarsely and then add them to the bowl. Add the rum, honey, cinnamon powder,1/4 cup powdered sugar and cacao powder to the bowl. Take a small portion of the mixture and with the help of your palm roll them into smooth balls. There should not be any crack in the balls. In a bowl add the remaining 1/4 cup icing sugar and the grated coconut and mix them well. Roll the balls carefully without cracking them in the sugar-coconut mixture. Store the rum balls in an air-tight container. It tastes best at least after 24 hours. You can store them up to two weeks.